It's no secret - I love leopard shoes. My most worn shoes are probably my leopard pumps. I have worn them so much I have gone through several pairs. The one thing I have yet to find is a pair of leopard boots that I love as much. One thing for sure, I have become more conscious of the type of shoes I buy. I no longer buy shoes for looks - they also have to be comfortable and wearable. I have found that block heels are the most comfortable. So, if anyone has recommendations of block heel leopard boots - let me know. Without getting lash extensions, I have been trying to get longer lashes. I can honestly say these three products have made a big difference. 1. I start with a lash primer. This is the one I use. I have tried the more expensive one - but this one works just as well (or maybe even better). 2. I use this product to add additional length to my lashes. 3. I use this product to add volume. I may alternate between steps #2 and 3 until I have the desired look. Also, another added benefit is that these products do not "smudge" as much during the day or at night when I clean my face. These booties are 33% off. This classic tee is on sale for $13. These flattering high rise skinny jeans are 50% off. These suede peep toe booties are on sale for $40. These cute suede ankle booties are 50% off. This velvet cardigan/blazer is over 75% off. This sweater is on sale for $10. This cute plaid skirt is 40% off. I can't believe this coat is on sale for $37. I love a comfy long sleeve tee like this one that is 70% off. This relaxed v-neck sweater (that's also cashmere) is 33% off. These popular tall suede boots are 60% off. This striped tee is 40% off. Looking for ideas of what to wear this winter? Check out my Pinterest inspiration. I'm with you - block heels are definitely the most comfortable! Your outfit sets are always perfection! I have a similar pink sweater in my sweater in my shopping cart and your third look is giving me just the push I need to get it since I have other similar pieces! Leopard makes everything better! I am always looking for a block heel - so much more stable and comfortable for me. Boy I'd love a Chanel bag too! 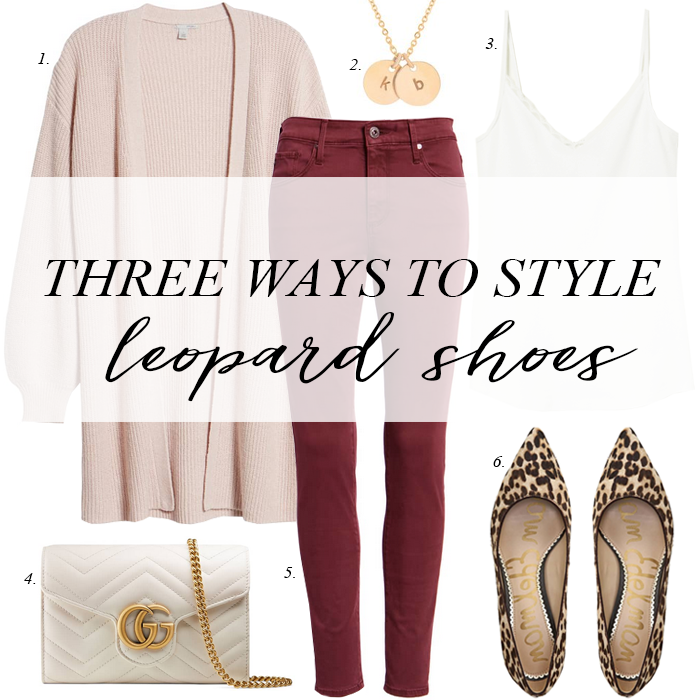 I love leopard print shoes and love all of these looks!